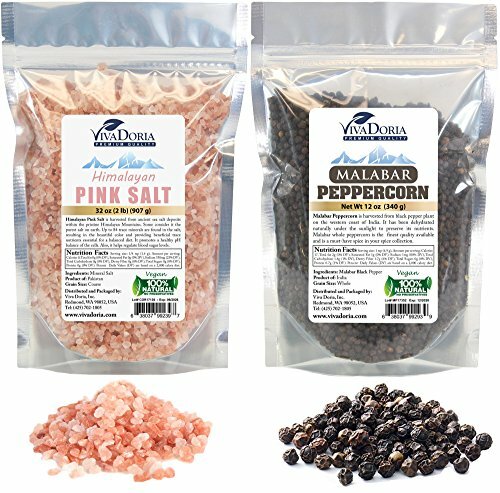 Refill your salt grinders with Viva Doria's premium quality Malabar Peppercorn and Himalayan Pink Salt. Malabar Peppercorn is hand-harvested from black pepper plant on the western coast of India. It has been dehydrated naturally under the sunlight to preserve its nutrients. Malabar Peppercorn is the best quality available and is a must-have spice in your spice collection. Himalayan Pink Salt is harvested from ancient sea salt deposits within the pristine Himalayan Mountains. Some consider it the purest salt on earth. Up to 84 trace minerals are found in the salt, resulting in the beautiful color and providing beneficial trace nutrients essential for a balanced diet. It promotes a healthy pH balance of the cells. Also, it helps regulate blood sugar levels.